Mercia was an Anglo-Saxon kingdom that controlled much of southern England from the sixth to the tenth century. Originally a pagan kingdom, it converted to Christianity about 626AD. It lost much of its territory to Viking raiders at the end of the ninth century and was eventually absorbed into Wessex. Though Mercia has not existed as an independent nation for over 1000 years, that did not stop someone from issuing this attractive 2017 dated 10 Pounds coin for Mercia. 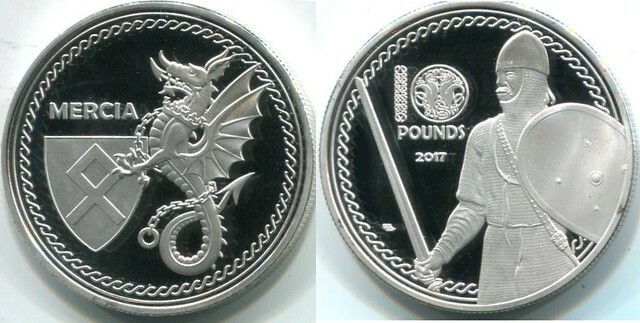 One side of the 40mm silver-plated Proof coin features the Mercian Arms and a dragon. The other side depicts a medieval knight with sword and shield. The coin has a mintage of only 200 pieces. The "someone" in the text above from Joel Anderson's website is Russian artist and coin dealer Vitaly Bakhtinov.